The Siberian Husky was originated by the Chukchi people of northeastern Asia as an endurance sled dog. When changing conditions forced these semi-nomadic natives to expand their hunting grounds, they responded by developing a unique breed of sled dog, which met their special requirements and upon which their very survival depended. The Chukchis needed a sled dog capable of traveling great distances at a moderate speed, carrying a light load in low temperatures with a minimum expenditure of energy. Research indicates that the Chukchis maintained the purity of their sled dogs through the 19th century and that these dogs were the sole and direct ancestors of the breed known in the United States today as the Siberian Husky. Shortly after 1900, Americans in Alaska began to hear accounts of this superior strain of sled dog in Siberia. The first team of Siberian Huskies made its appearance in the All Alaska Sweepstakes Race of 1909.The same year, a large number of them were imported to Alaska by Charles Fox Maule Ramsay, and his team, driven by John "Iron Man" Johnson, won the grueling 400-mile race in 1910. 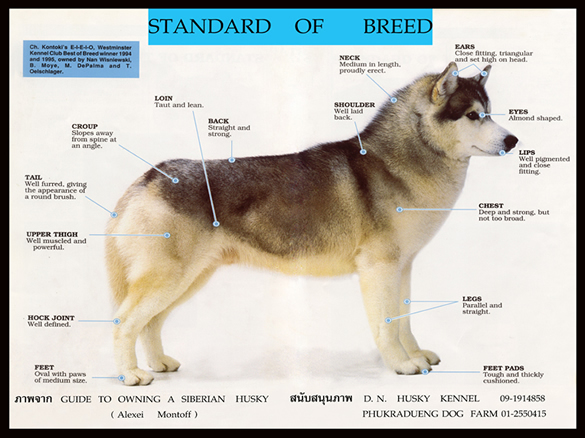 For the next decade, Siberian Huskies, particularly those bred and raced by Leonhard Seppala, captured most of the racing titles in Alaska, where the rugged terrain was ideally suited to the endurance capabilities of the breed. In 1925, the city of Nome, Alaska, was stricken by a diphtheria epidemic and supplies of antitoxin were urgently needed. Many sled dog drivers, including Mr. Seppala, were called upon to relay the lifesaving serum to Nome by dog team. This heroic "serum run" focused attention upon Siberian Huskies, and Seppala brought his dogs to the United States on a personal appearance tour. While here, he was invited to compete in sled dog races in New England, where the sport had already been introduced. The superior racing ability and delightful temperament of Seppala's Siberian Huskies won the respect and the hearts of sportsmen from Alaska to New England. It was through the efforts of these pioneer fanciers that the breed was established in the United States and that AKC recognition was granted in 1930. Many Siberian Huskies were assembled and trained at Chinook Kennels in New Hampshire for use on the Byrd Antarctic Expeditions. Dogs of the breed also served valiantly in the Army's Arctic Search and Rescue Unit of the Air Transport Command during World War II. DATE OF PUBLICATION OF THE ORIGINAL VALID STANDARD: 02.02.1995. CLASSIFICATION F.C.I. : Group 5 Spitz and primitive types. Section 1 Nordic Sledge Dogs. BEHAVIOUR / TEMPERAMENT: The characteristic temperament of the Siberian Husky is friendly and gentle, but also alert and outgoing. He does not display the possessive qualities of the guard dog, nor is he overly suspicious of strangers or aggressive with other dogs. Skull: Of medium size and in proportion to the body; sligthly rounded on top and tapering from the widest point to the eyes. GAIT / MOVEMENT: The Siberian Husky’s characteristic gait is smooth and seemingly effortless. He is quick and light on his feet, and when in the show ring should be gaited on a loose lead at a moderately fast trot, exhibiting good reach in the forequarters and good drive in the hindquarters. When viewed from the front to rear while moving at a walk the Siberian Husky does not single-track, but as the speed increases the legs gradually angle inward until the pads are falling on a line directly under the longitudinal center of the body. As the pad marks converge, the forelegs and hind legs are carried straightforward, with neither elbows nor stifles turned in or out. Each’hind leg moves in the path of the foreleg on the same side. While the dog is gaiting, the topline remains firm and level. HAIR: The coat of the Siberian Husky is double and medium in length, giving a well furred appearance, but is never so long as to obscure the cleancut outline of the dog. The undercoat is soft and dense and of sufficient length to support the outer coat. The guard hairs of the outer coat are straight and somewhat smooth lying, never harsh nor standing straight off from the body. It should be noted that the absence of the undercoat during the shedding season is normal. Trimming of whiskers and fur between the toes and around the feet to present a neater appearance is permissible. Trimming the fur on any other part of the dog is not to be condoned and should be severely penalized. Height at withers: Dogs: 21 to 23, 5 inches (53,5 - 60 cm). Weight: Dogs : 45 to 60 pounds (20,5 - 28 kg).